Those of you who've been around here for a while might remember the Hot Pad of the Month series I started in 2015 that ended eighteen months later. We could go back even further to the coffee cup sleeve series, which was way back in 2013. Well, I've intended to start another monthly series, but I was a little up in the air about what it would be. That is, until inspiration hit me last month. This time, I'm going to do a project each month that involves hoop art, which basically means anything I can fit in an embroidery hoop. I have a full page of potential ideas, which of course I'll have to winnow down, but I'm excited about it. Some months will involve sewing, others won't. The sizes will vary. You'll probably see a variety of mediums and supplies, like fabric, buttons, felt, embroidery floss, maybe even some a little more unexpected. I can't wait any longer to share the first one with you! I'd like to point out, unlike my other series, I'm actually starting this one in January! Barely, but still. Since we all know it takes a while to make stuff, I had next month's Valentine's Day on my mind for this one. 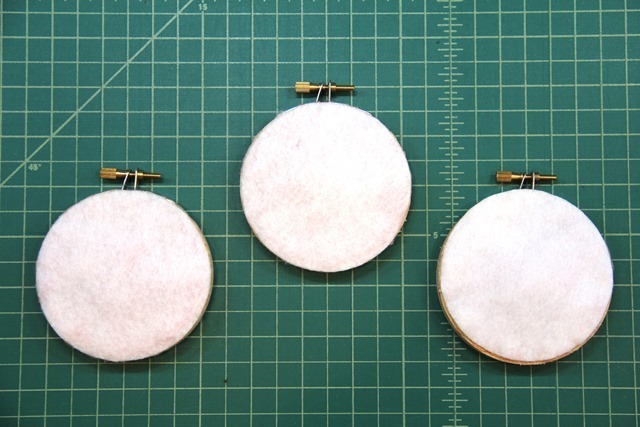 All you'll need to make these is fabric, three 3" embroidery hoops, felt, a hot glue gun and this pattern. Technically, there are two different ways you can sew this together. You could trace each tiny piece, adding 1/4" seam allowance, and sew them all together. 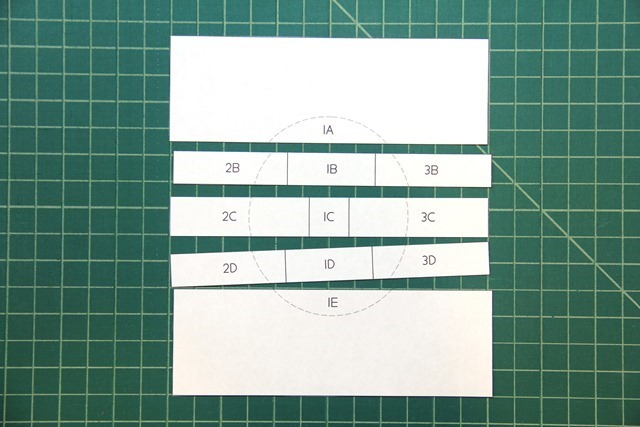 The other option is paper piecing, which is what I recommend and the method I used. Some of these pieces are pretty small, and that's the easiest way to handle them. If you're unfamiliar with how to do paper piecing, I highly recommend this video by The Crafty Gemini. 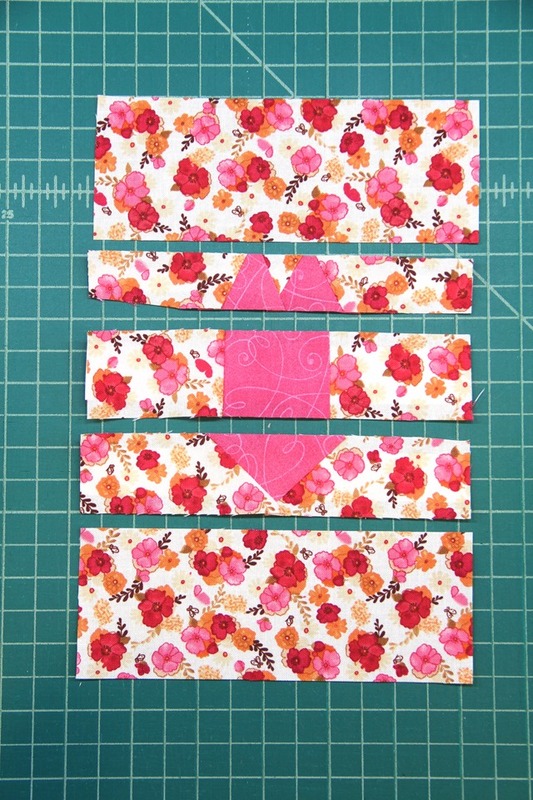 To start, cut out each pattern square on the outside line. Cut the horizontal lines only inside the square. Leave the vertical lines intact. The circle is only a guide to show where the embroidery hoop will be in the end. The I is the easiest of the three, because there are no angles. When you're sewing the others, just be sure your fabric covers the area it should and leaves enough for your 1/4" seam allowance. I'll admit, I used the seam ripper a couple of times trying to get that right. I also freaked out thinking I had completely messed up the heart and it wasn't going to fit together, but I forgot to account for the seam. See? Not perfect, but acceptable. My new mantra. The U has a couple of angles to it too. But we're talking about hoop art here. I know I'm probably the only person who'll ever see the back of these (in person), but I needed them to look finished anyway. Trace the embroidery hoop onto a piece of felt and cut it out just inside the line. You'll need three of those. Insert the square into the embroidery hoop, making sure it's centered before tightening the screw. You can trim some of the fabric if you like, but I found it was easy to stuff it inside the back as it was. Hot glue around the edge of the hoop and press the felt over the top. I found it worked better if I glued one half, then the other. You can get a little creative here and add some ribbon or trim. I tied a ribbon bow at the top, then took it off because I actually preferred them without it. I hope you're looking forward to the rest of this year as much as I am!